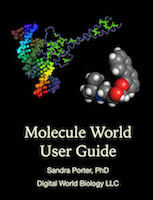 Sandra Porter, PhD, president of Digital World Biology will be speaking on Friday, Mar. 16th at Flathead Valley Community College's DNA Bootcamp for Teachers in Kalispell, MT. Dr. Porter will work with teachers on using molecular modeling to see how proteins (or drugs) bind to DNA molecules and in exploring mutations that affect protein structure and function. The workshop is sponsored by a grant from the Advanced Technology Education Program at the National Science Foundation.